FKLI Aug Futures contract traded 0.5 points higher to close at 1183.5 levels as compare to previous trading session to with a total of 4,405 lots traded in the market. FKLI was traded sideways towards downside as regional indices weaken due to some profit taking activities for weekend holidays. 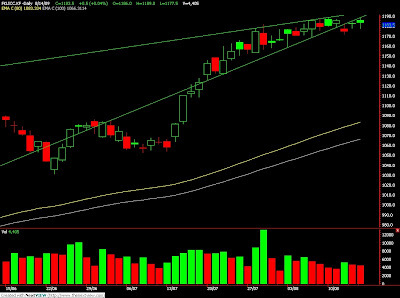 Technically, FKLI seems challenged lower resistance trend line and previous high point at 1189.5 levels. Based on our technical analyst, our opinion suggests FKLI would trade lower in the coming trading session provided resistance levels at 1189.5 and 1196 were not violated during trading sessions. However, traders were advice to hold short position in the coming trading session while be alert around support levels at 1178 and 1172 levels. CPO 3rd month Oct futures contract plunge RM74 points lower as compare to previous trading sessions to close at RM2441 with a total of 12,274 lots traded in the market. CPO price were traded wild during trading session as crude oil and soybean oil were traded firm against selling pressure while heavy profit taking activities for weekend ahead. Aug. 14 (Bloomberg) -- Gold climbed for a third day and headed for a fifth weekly advance as investors sought an alternative to a weakening dollar and commodities rose on signs of an economic turnaround. Bullion is on course for the longest weekly winning streak since November 2007. The Dollar Index, a six-currency gauge of the greenback’s value, fell as much as 0.7 percent yesterday after the German economy, Europe’s largest, unexpectedly expanded in the second quarter. Hong Kong’s economy probably grew 1.2 percent last quarter from the previous three months, a Bloomberg survey showed. Gold for immediate delivery rose 0.2 percent to $956.47 an ounce at 2:03 p.m. in Singapore. The metal is up 8.4 percent this year and 0.2 percent this week. Crude oil for September delivery rose 0.5 percent to $70.89 a barrel. Thirteen of 27 traders, investors and analysts surveyed by Bloomberg News, or 48 percent, said bullion would gain next week. Six forecast lower prices and eight were neutral. There remains the risk of a gold price decline on the back of the liquidation of speculative long positions that are “at a high level at present,” Eugen Weinberg and other analysts with Commerzbank AG wrote in a note yesterday. “The prevalent dollar weakness is currently preventing this development,” they said. Long positions are bets that prices will gain. Holdings in the SPDR Gold Trust, the biggest exchange- traded fund backed by bullion, were unchanged at 1,065.49 metric tons as of Aug. 13, according to the company’s Web site. Among other precious metals for immediate delivery, silver was up 0.3 percent at $15.075 an ounce, platinum rose 0.6 percent to $1,275.25 an ounce and palladium added 0.9 percent to $278.75. Aug. 13 (Bloomberg) -- Crude oil prices, which have surged 60 percent this year, may not rise above $80 a barrel because spare production capacity among OPEC members has swollen. The CHART OF THE DAY shows the relationship between crude oil futures traded in New York and excess output capacity of the Organization of Petroleum Exporting Countries this decade. Prices climbed to a record $147.27 on July 11, 2008, when OPEC members had the ability to bring fewer than 3 million barrels of additional production online. In March the 12-member group could have produced 6.84 million barrels a day above its actual production, if needed, the most since 2001, according to a monthly Bloomberg News survey of oil companies, producers and analysts. That margin was 6.11 million barrels last month. OPEC agreed at three meetings last year that the members with quotas would cut output by a combined 4.2 million barrels a day to 24.845 million in a bid to bolster prices. The group is scheduled to discuss production levels in Vienna on Sept. 9 after leaving output unchanged at two meetings this year. Saudi Arabian Oil Minister Ali al-Naimi said on May 23 in Rome that crude oil at $75 a barrel would be healthy for the global economy. The aim will be “keeping it between $70 and $80,” he said. The Kingdom is the world’s biggest oil exporter. Aug. 14 (Bloomberg) -- Crude oil rose for a third day after U.S. equities rallied to a 10-month high and the German and French economies unexpectedly grew, sparking hopes for a rebound in fuel demand. Oil advanced as much as 2.9 percent after Europe’s two largest economies expanded by 0.3 percent in the second quarter. The Standard & Poor’s 500 Index rose to its highest in 10 months after the U.S. Federal Reserve said it would keep benchmark interest rates “exceptionally low” for an “extended period” to help sustain a recovery. Crude oil for September delivery rose as much as 68 cents, or 1 percent, to $71.20 a barrel on the New York Mercantile Exchange at 7:20 a.m. in Singapore. Yesterday, the contract gained 0.5 percent to settle at $70.52 a barrel. Futures have advanced 60 percent this year. Gross domestic product in Europe fell 0.1 percent from the first quarter, when it plunged 2.5 percent, the most since the euro-area data were first compiled in 1995, the European Union’s statistics office in Luxembourg said today. In Germany, Europe’s largest economy, second-quarter GDP rose a seasonally adjusted 0.3 percent from the first quarter, when it dropped 3.5 percent. The French economy also expanded 0.3 percent in the latest quarter. Brent crude oil for September settlement gained 59 cents, or 0.8 percent, to close at $73.48 a barrel on London’s ICE Futures Europe exchange. U.S. total daily fuel use averaged 18.9 million barrels in the past four weeks, down 3 percent from a year earlier, the department said. U.S. gasoline consumption typically drops after the Labor Day holiday in early September. Refiners cut operating rates by 1.1 percentage points to 83.5 percent of capacity, the lowest since May. Gasoline for September delivery rose 0.9 percent to settle at $2.0374 a gallon on the exchange. Aug. 13 (Bloomberg) -- Gold rose to the highest price this week as the dollar declined, increasing the metal’s appeal as an alternative investment. Silver climbed to a two-month high, and platinum and palladium rose. The dollar fell for a third day against a basket of six major currencies after a report showed U.S. retail sales unexpectedly fell last month, adding to concern that consumers are unwilling to increase spending. The greenback slid as much as 0.9 percent against the euro after the German economy, Europe’s largest, unexpectedly expanded in the second quarter. Bullion tends to climb when the U.S. currency weakens. Gold futures for December delivery rose $4, or 0.4 percent, to $956.50 an ounce on the New York Mercantile Exchange’s Comex division. Earlier, the price reached $963.10, the highest since Aug. 7. 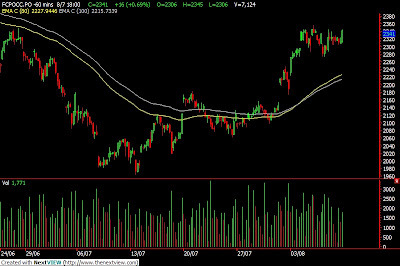 “Today’s session close over the 20-day moving average is a good sign from the bullish prospective,” Al Abaroa, a senior commodities strategist at OptionsPro Corp. in Plantation, Florida, said by e-mail. In London, bullion for immediate delivery advanced $7.70, or 0.8 percent, to $954.80 an ounce at 7:50 p.m. local time. Spot prices slid for five days through Aug. 11, the longest decline in five months. “Gold prices continue to track currency movements and bounce back above the $950-an-ounce level,” Suki Cooper, an analyst at Barclays Capital in London, said in a report. The metal slipped to $953.50 in the London afternoon “fixing,” the price used by some mining companies to sell their output, from $956 in the morning fixing. U.S. retail sales fell 0.1 percent in July from June, the Commerce Department said today in Washington. The median forecast of 76 economists in a Bloomberg News survey was for an increase of 0.8 percent. The Federal Reserve yesterday extended by a month the scheduled completion of a $300 billion program to purchase U.S. Treasuries, or so-called quantitative easing, aiming for a “smooth transition in markets,” according to a statement from the central bank. The Fed left the target rate for overnight bank lending between zero and 0.25 percent, near record lows. Gold “should remain supported by the inflationary impact of the Fed’s rate decision, in addition to the boost to general risk sentiment,” James Moore, an analyst at TheBullionDesk.com in London, said in a report. Expectations for a weaker dollar over the next six months increased, according to 2,345 respondents from New York to Tokyo in the Bloomberg Professional Global Confidence Index. Gold will average $925 an ounce in next year, ING Groep NV said yesterday in a report, 16 percent higher than a previous forecast, because of “potentially inflationary implications of quantitative easing” and limited mine-output growth. The bank raised this year’s price estimate to $925 from $900. Silver futures for September delivery gained 40.2 cents, or 2.8 percent, to $14.987 an ounce in New York, after touching $15.145, the highest for a most-active contract since June 12. The price will average $13.50 next year, 17 percent higher than its previous estimate, ING said. Platinum for October delivery rose $28.30, or 2.3 percent, to $1,272.70 an ounce, and palladium for September delivery gained $4.80, or 1.8 percent, to $278.15 an ounce in New York. Aug. 14 (Bloomberg) -- Wilmar International Ltd., the world’s biggest palm oil trader, said second-quarter profit climbed 23 percent partly on higher palm oil processing margins. Net income rose to $407.2 million, or 6.4 cents a share, in the three months ended June 30 from $331.7 million, or 5.2 cents, a year earlier, the company said today in a statement to the Singapore stock exchange. Sales declined 27 percent to $5.7 billion as prices of commodities fell, it said. Wilmar, which supplies almost half of China’s cooking oil and operates soybean crushers there, benefited as the world’s third-largest economy boosted imports of palm oil and oilseeds. Wilmar’s shares jumped 7 percent to S$6.58 at the close yesterday, valuing the company at S$42 billion ($29 billion). China’s imports of soybeans soared to a record 4.71 million metric tons in June, taking the nation’s overseas purchases to 22.1 million tons, up 28 percent in the first six months of the year, according to customs data. The nation imported 11.9 million tons in the second quarter, it said. The Asian nation’s imports of palm oil from Malaysia, the world’s second-largest producer, gained 7.4 percent to 925,890 tons in the second quarter, from 862,280 tons the previous three months, according to data from independent cargo surveyor Societe Generale de Surveillance. Wilmar also owns oil palm plantations in Malaysia and Indonesia. Aug. 14 (Bloomberg) -- The yen gained versus the euro and the dollar on speculation Japanese companies are bringing back earnings on overseas assets. Japan’s currency advanced against all of its 16 major counterparts on prospects domestic investors may be repatriating income that they will receive from Treasuries. The U.S. government is expected to make $79.2 billion in redemptions and coupon payments for Treasuries on Aug. 17, according to Bank of Tokyo-Mitsubishi UFJ Ltd. The yen rose to 136.08 per euro as of 8:58 a.m. in Tokyo from 136.46 in New York yesterday. Japan’s currency climbed to 95.33 against the dollar from 95.48. The euro traded at $1.4283 from $1.4292. FKLI Aug Futures contract surge 8 points to close at 1183 levels as compare to previous trading session to with a total of 4,604 lots traded in the market. FKLI was traded strong as Dow Jones and regional indices were boosted after news release by FED during overnight trading. 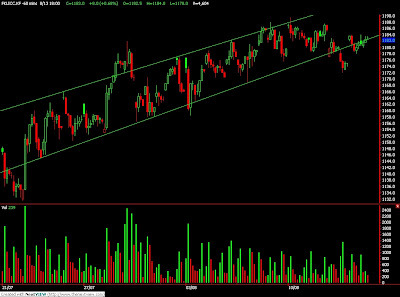 Technically, FKLI mainly seen traded sideways throughout the trading session while lack of traded volume indicates sideways market still intact. Based on our technical analyst, our opinion suggests FKLI still looking at the downside provided resistance levels at 1187 and 1194 were not violated. 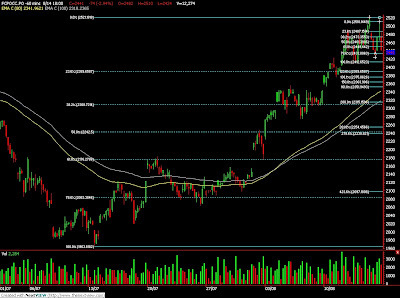 Traders were advice to hold short position while being cautious around support levels at 1178 and 1170 regions. CPO 3rd month Oct futures contract surge RM55 points higher as compare to previous trading sessions to close at RM2515 with a total of 11,399 lots traded in the market. CPO price were traded higher as crude oil and soybean oil were trade higher during electronic trading session. 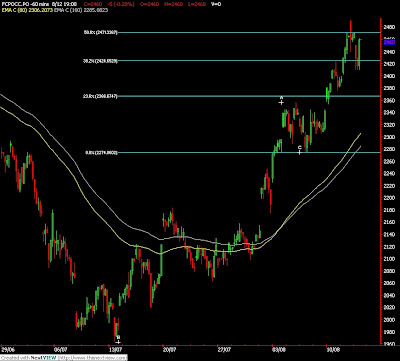 Technically, CPO price manage to complete 61.8% Fibonacci projection levels at RM2517 regions after long consolidation around RM2465 and RM2450 regions. Based on our technically interpretation, our technical opinion suggest CPO would likely to retrace in the next trading session where support seen at RM2389 and RM2300 levels while short term supports seen at RM2460 and RM2410 levels. Traders were advice to hold short position in the coming trading session provided resistance levels at RM2520 and RM2583 were not violated. Aug. 13 (Bloomberg) -- Crude oil rose for a second day after U.S. equities increased and the country’s Federal Reserve said the economy is “leveling out,” bolstering speculation that energy demand will improve. Oil gained as the Dow Jones Industrial Average added 1.3 percent and a drop in the dollar against the euro bolstered crude as an alternate investment. The Fed said it will slow the pace of its $300 billion program to buy U.S. Treasuries as the recession eases. Crude oil for September delivery rose as much as 64 cents, or 0.9 percent, to $70.80 a barrel on the New York Mercantile Exchange. It was at $70.51 a barrel at 7:34 a.m. in Singapore. Yesterday the contract gained 1 percent to settle at $70.16 a barrel. Futures have climbed 58 percent this year. Stocks rebounded from the market’s biggest drop in a month. The Standard & Poor’s 500 Index advanced 1.2 percent to 1,005.81, as of 4:07 p.m., and the Dow gained 120.16 points to 9,361.61. The dollar declined against most major currencies after the Fed said it will keep the interest rate “exceptionally low” for an extended period and wind down its purchases of Treasuries by the end of October. The dollar traded at $1.4207 per euro at 8:10 a.m. in Tokyo from $1.4188 per euro yesterday in New York. Oil also rose as the International Energy Agency boosted its oil-demand outlook for this year and next. The world will need an average of 85.25 million barrels of oil a day next year, 70,000 barrels more than previously estimated, the IEA, adviser to 28 nations, said in its report yesterday. U.S. total daily fuel use averaged 18.9 million barrels in the past four weeks, down 3 percent from a year earlier, the Energy Department said yesterday in a weekly report. U.S. gasoline consumption typically drops after the Labor Day holiday in early September. American motor-fuel demand peaks during the summer months when people take vacations. Oil supplies increased by 2.52 million barrels to 352 million in the week ended Aug. 7, the Energy Department said. Inventories were forecast to climb by 1 million barrels, according to the median of analyst estimates in a Bloomberg News survey. Brent crude oil for September settlement on London’s ICE Futures Europe Exchange added 43 cents, or 0.6 percent, to $72.89 a barrel. Aug. 12 (Bloomberg) -- Gold advanced for a second straight day as the dollar weakened, boosting the appeal of precious metals as alternative assets. Silver gained, while platinum and palladium declined. The dollar fell as much as 0.7 percent against a basket of six major currencies before easing losses after the Federal Reserve outlined plans to slow purchases of $300 billion in Treasury debt. The Fed left interest rates unchanged and said the economy is “leveling out,” in a statement. Bullion, which often falls when the dollar strengthens, pared gains. “Gold was trading lower on expectations that the Fed’s slowing of purchases of Treasuries will boost yields and be supportive of the U.S. dollar and in turn pressure the price of gold,” Ralph Preston, a Heritage West Futures Inc. analyst in San Diego, said by e-mail. Gold futures for December delivery rose $4.90, or 0.5 percent, to settle at $952.50 an ounce on the New York Mercantile Exchange’s Comex division before the Fed release. The most-active contract traded at $948.50 an ounce at 4:08 p.m. in New York, up 90 cents from yesterday. Gold’s “near-term direction is likely to depend on the reaction to the Fed statement and whether the statement bolsters risk appetite or prompts a reduction in exposure,” James Moore, an analyst at TheBullionDesk.com in London, said in a report. “We think the dollar is vulnerable to downside pressure,” because expectations for a Fed rate increase have been pushed back, the strategists said. Bullion for immediate delivery in London advanced 45 cents to $946.55 an ounce at 9:05 p.m. local time, halting the longest slide in five months. The spot price dropped 2.2 percent in the previous five sessions. Gold increased to $947.25 in the London afternoon “fixing,” the price used by some mining companies to sell their output, from $943.50 in the morning fixing. Gold has dropped as much as 3.2 percent in London since reaching a two- month high of $971.68 an ounce on Aug. 6. The price climbed to a record $1,032.70 in March 2008. Investment in the SPDR Gold Trust, the biggest exchange- traded fund backed by bullion, fell for a third day, sliding 3.06 metric tons to 1,065.49 tons as of yesterday, data on the company’s Web site show. The fund reached a record 1,134.03 tons on June 1. Silver futures for September delivery gained 24 cents, or 1.7 percent, to $14.585 an ounce in New York. Platinum futures for October delivery fell 70 cents to $1,244.40 an ounce, and palladium futures for September delivery dropped $1.80, or 0.7 percent, to $273.35 an ounce in New York. Aug. 13 (Bloomberg) -- The yen fell for a second day against the euro after the Federal Reserve said economic activity is “leveling out,” sapping demand for Japan’s currency as a refuge. The yen also weakened against all 16 major currencies as Asian stocks extended a U.S. equity rally on signs the global slump is abating, encouraging investors to buy higher-yielding securities. The euro rose for a third day versus the dollar before a government report that economists said will show the contraction in Europe’s economy slowed last quarter. The yen declined to 136.54 per euro as of 9:13 a.m. in Tokyo from 136.32 in New York yesterday. Japan’s currency traded at 96.07 per dollar from 96.06. The euro advanced to $1.4215 from $1.4188. The Nikkei 225 Stock Average rose 0.8 percent and the MSCI Asia Pacific Index gained 0.8 percent. The Standard & Poor’s 500 Index added 1.2 percent in New York yesterday following the Fed’s policy statement. The Fed has left its target rate for overnight lending between zero and 0.25 percent since December. The central bank said yesterday in Washington it will wind down purchases of Treasuries that had been slated to end in September. “The committee has decided to gradually slow the pace of these transactions and anticipates that the full amount will be purchased by the end of October,” the Federal Open Market Committee said in a statement after its two-day meeting. The euro gained for a third day against the dollar before the European Union’s statistics office releases its second- quarter gross domestic product numbers in Luxembourg. GDP in the 16-nation euro area shrank 0.5 percent after a 2.5 percent contraction in the first quarter, according to a Bloomberg News survey of economists. FKLI Aug Futures contract closed 10.5 points lower at 1175 as compare to previous trading session with a total of 5,190 lots traded in the market. FKLI was traded lower partly due to regional sell down especially for Hang Seng index and ShangHai index. Technically, FKLI seems break down from the supporting trend line in the hourly chart after previous support levels at 1178 were violated. Based on our technical analyst, our opinion suggest FKLI would trade lower in the coming trading session after long consolidation within 1188 to 1178 range. Traders were advice to hold short position in the coming trading session while be cautious around resistance levels at 1183 and 1194 regions. Supports were seen at 1170 and 1163 regions. FCPO Oct Futures contract closed RM15 lower at RM2450 as compare to previous trading session with a total of 9,685 lots traded in the market. CPO price were traded wide range as influence by crude oil and soybean oil electronic trading. 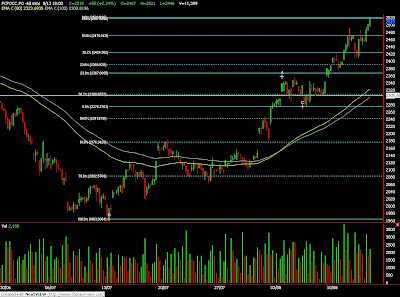 Technically, CPO opened high but manages to temporary supported above support levels at RM2400 region. Based on our technical point of view, our opinion suggest CPO price was slightly overbought after traded higher for 5 consecutive trading days as shown from the stochastic and RSI. We suggestion CPO might pull slightly in the coming trading session where support levels were seen at RM2370 and RM2290 regions. Traders were advice to hold short position for short term trading while be cautious around resistances levels at RM2473 and RM2520 regions. Aug. 7 (Bloomberg) -- Gold fell for the third straight day as an unexpected drop in U.S. unemployment drove the dollar higher, damping the appeal of the precious metal as an alternative investment. Silver rose. The dollar gained as much as 1.3 percent against a basket of six major currencies. The jobless rate in June fell to 9.4 percent, the first decline since April 2008. Economists forecast an increase to 9.6 percent. Gold futures for December delivery fell $3.40, or 0.4 percent, to $959.50 an ounce on the Comex division of the New York Mercantile Exchange. The metal dropped by the same amount in each of the previous two days. The price gained 0.4 percent this week. Bullion for immediate delivery dropped $8.52, or 0.9 percent, to $954.73 at 2:39 p.m. New York time. Gold may advance next week as investors seek an alternative to the dollar, according to a Bloomberg News survey. On Aug. 5, the dollar touched an 11-month low against the currency basket. Eleven of 20 traders, investors and analysts said bullion would gain. Five forecast lower prices and four were neutral. Silver for September delivery rose 2.3 cents, or 0.2 percent, to $14.668 an ounce in New York. The metal rose 5.2 percent this week. Aug. 10 (Bloomberg) -- Crude oil fell for a third day as gasoline futures declined on signs of slowing seasonal demand for auto fuel late in the U.S. summer. Oil fell from a five-week high of $72.84 a barrel on Aug. 7 after the dollar jumped the most in two months on a report showing U.S. employers eliminated fewer jobs than expected last month. Oil prices around $70 are “not bad” and necessary to maintain investment, OPEC President Botelho de Vasconcelos told reporters in the Angolan capital of Luanda yesterday. “Oil’s looking a little bit vulnerable to some more downside in the first couple of days this week,” said Toby Hassall, research analyst at Commodity Warrants Australia Pty in Sydney. The dollar’s rally “really undermines a lot of these commodities including oil,” he said. Crude oil for September delivery fell as much as 61 cents, or 0.9 percent, to $70.32 a barrel in after-hours electronic trading on the New York Mercantile Exchange. It was at $70.53 at 7:34 a.m. in Singapore. The contract fell 1.4 percent to $70.93 a barrel on Aug. 7, its lowest settlement in a week, as the dollar climbed and gasoline futures fell the most in seven sessions. New York oil futures gained 88 percent the past six months as rising equity markets buoyed investor confidence, and the falling U.S. dollar made commodities more attractive. Prices reached an eight-month high of $73.38 a barrel on June 30. While the decline in the U.S. unemployment rate to 9.4 percent was better than expected, it remains high “and that doesn’t bode well for demand at least in the short-term,” Hassall said. Seasonal motoring demand in the U.S. also seems to have been “fairly muted,” he said. Gasoline for September delivery dropped 0.8 percent to $1.9930 a gallon today after declining 2.6 percent to $2.0081 on Aug. 7, the lowest settlement since July 30. U.S. gasoline demand usually peaks June through August. Total daily fuel use averaged 18.9 million barrels in the four weeks ended July 31, 3.1 percent less than a year earlier, the Energy Department said last week. The U.S. currency was at $1.4187 to the euro in early Asian trading. It climbed 1.1 percent to $1.4183 on Aug. 7, its fourth straight gain and the biggest increase since June 15. Brent crude oil for September settlement was untraded on London’s ICE Futures Europe exchange today. It fell $1.24, or 1.7 percent, to $73.59 a barrel on Aug. 7. Aug. 10 (Bloomberg) -- The dollar traded near a one-week high against the euro on signs the U.S. economy is emerging from recession, boosting the appeal of the nation’s assets. The dollar was close to a seven-week high versus the yen as U.S. employers eliminated fewer jobs last month than economists forecast, adding to evidence the slump in the world’s largest economy is abating. The yield advantage of 10-year Treasuries over similar-maturity Japanese bonds widened to 2.42 percentage points, the most since November, making U.S. assets more attractive to Japanese investors. The dollar traded at $1.4195 per euro as of 9:38 a.m. in Tokyo from $1.4183 in New York on Aug. 7, when it rose to $1.4155, the highest level since July 31. The U.S. currency declined to 97.23 yen from 97.57 yen. It touched 97.79 yen on Aug. 7, the strongest since June 16. The euro fell to 138.01 yen from 138.41 yen on Aug. 7, when it climbed to 138.72 yen, the highest since June 5. Europe’s currency traded at 85.07 pence from 84.98 pence. Exchange-rate movements may be exaggerated by Japan’s O-bon holidays this week, when Japanese often take week-long vacations to honor ancestors, Ishikawa said. The gains in the greenback on Aug. 7 marked a return to the view that good U.S. economic news should benefit the currency as traders speculated that the Federal Reserve will boost borrowing costs sooner rather than later. U.S. employers eliminated 247,000 jobs in July after a revised decrease of 443,000 in the previous month, the Labor Department said on Aug. 7. The median forecast of 82 economists surveyed by Bloomberg News was for a reduction of 325,000. The unemployment rate decreased to 9.4 percent, whereas economists predicted an increase. The Dollar Index, which the ICE uses to track the dollar against the currencies of six major trading partners including the euro, yen and pound, advanced 0.8 percent last week to 78.975. The gauge was at 78.845 today. The yen gained amid speculation Japanese exporters took advantage of the currency’s drop to a seven-week low versus the dollar and a two-month low against the euro to repatriate funds. FKLI Aug Futures contract closed 6 points lower at 1179.5 as compare to previous trading session with a total of 4,803 lots traded in the market. FKLI was traded lower partly due to regional sell down due to profit taking activities as weekend is ahead. 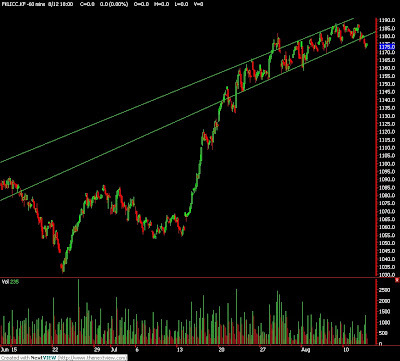 Technically, FKLI didn’t manage to breach the upper resistance trend line at 1186 regions and was traded lower to search for supports. Based on our technical view, our opinion suggest FKLI would trade lower in the coming trading session; despite Dow Jones were closed strong on overnight trading, provided resistance levels at 1183 and 1187 were not violated during trading session. Traders were advice to hold short position in the coming trading session while be alert around support levels at 1177 and 1170 levels. FCPO Oct Futures contract closed RM16 higher at RM2341 as compare to previous trading session with a total of 7,124 lots traded in the market. CPO price was trade sideways on most of the trading period but surge up just few minutes before market closed despite not much movement in crude oil and soybean oil electronic trading. Technically, CPO price manage to burst up after long consolidation in descending triangle formation with support level at RM2306 hit twice. Based on our technical view, our opinion suggest CPO still seen uncertain on the trend direction as critical resistance levels at RM2350 and RM2380 were not violated while support levels at RM2300 and RM2170 were not challenged. 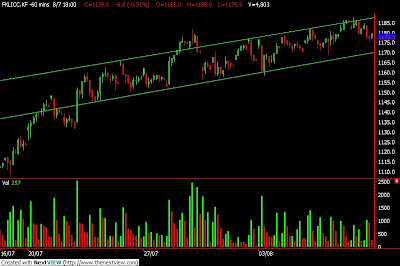 However, traders were advice to hold long position once resistance levels were breach during trading session.